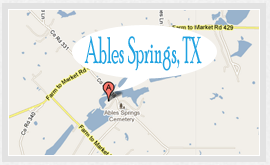 Ables Springs is on Farm Road 429 ten miles northeast of Terrell in northeastern Kaufman County. It was for many years a center for local religious and school activities. In 1853 James and Eliza Godfrey Ables settled there on land that had been granted in 1848 by the state of Texas to James's father, Ezekiel. In 1878 Mr. and Mrs. Ables deeded to the Methodist Episcopal Church, South, 8.75 acres "to be used as a campground or for any other purposes they might desire." On this land were built a tabernacle, a church, and a school, and a portion was set aside for the cemetery. Camping facilities were available. In 1915 a writer made note of the community's "old-fashioned religious camp meetings." Few people actually settled on the spot. In the mid-1980s a Baptist church met where the Methodist church once flourished; a Church of Christ met nearby. The freshwater spring that once flowed is dry today. The school, which many alumni still remember, is now part of the Terrell school system. Jack Stoltz, "ABLES SPRINGS, TX," Handbook of Texas Online (http://www.tshaonline.org/handbook/online/articles/hra67), accessed November 10, 2013. Published by the Texas State Historical Association.